We offer flexible early morning and evening appointments. RJ Skin clinic is an aesthetic clinic located in the picturesque market town of Glossop in the High Peak. The clinic offers free parking and as is conveniently located five minutes’ drive from the town centre with transport links to Manchester, Sheffield, Ashton-under-Lyne, Hyde, Buxton and Stockport. Our aim is to restore and enhance your skin’s natural beauty delivering subtle and discreet enhancements that can not only make you look better, but can help you to feel better too. As a client of RJ Skin Clinic you can be assured you are in safe hands. 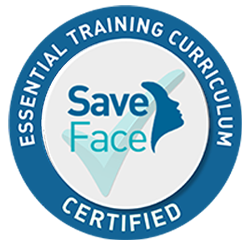 We are the only clinic in the High Peak registered and inspected by Save Face, the industry and government approved regulator. Our procedures are carried out by GMC Practitioners each with a minimum of over 20 years medical experience. All our clients benefit from a free no obligation consultation prior to treatment with an opportunity for a free review appointment afterwards. * One “area" is defined as Glabella or Crow's feet. Treatement to the forehead will always be two areas (Forehead and Glabella). RJ Skin Clinic uses the non-permanent Juvéderm range of dermal fillers from the Ultra and Volift range. The most appropriate treatment will be explored during your clinical examination.